It was the best of times and the worst of times…well maybe just the worst. A little over 80 years ago, almost one-fourth of all wage earning Americans were unemployed. I am of course, referring to the Great Depression. American culture at the time was engrossed in the desire to be distracted from their constant struggles. Listening to a broadcast about cowboys in the Wild West, swing dancing to a brass band or laughing at a screwball comedy was how they dealt with the pressure. Cirque Mechanics’ Birdhouse Factory brings that time period back to life. It is a tale set in a 1930’s widget factory that, throughout the show, is transformed and recreated by the imagination and drive of the American worker. Being that this show has toured all across the United States, Europe and Hong Kong, it came as no surprise that the UC Davis Mondavi Center for the Performing Arts would be hosting them for a night of entertainment. The show begins outside the doors of H. Rosebud Factory. Several workers dressed in shaggy clothes line up to wait for their boss to open the gates. Once inside, work begins. Birdhouse Factory is a circus view of the Great Depression. Tired and exhausted workers “fix” light fixtures by aerial rope performances. They take their lunch breaks by performing body contortionisms on moving platforms. They fix floors by doing trampoline flips on to them and end the day juggling 6 balls with canes balanced on their heads. 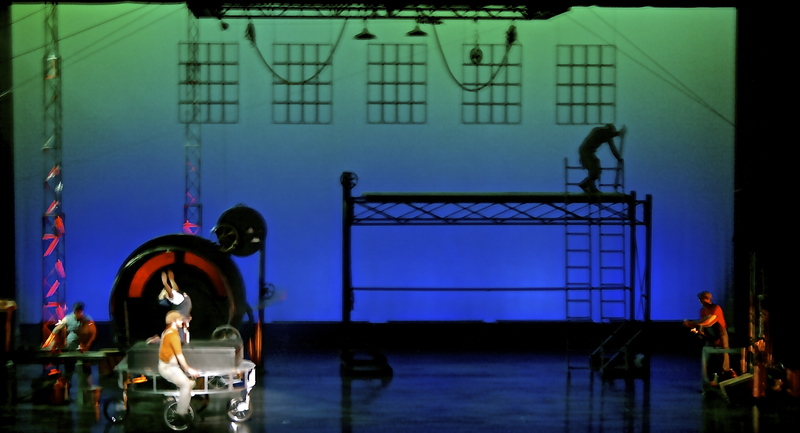 Through an artistic and creative lens, Cirque Mechanics shows how important imagination was at that time. Sure back in the 1930’s factory workers weren’t doing aerial ring performances, but I’d bet they were dreaming of so much more. After a machine malfunction, the closing of the factory and a freak birdhouse improvisation the factory opens yet again. H. Rosebud is transformed in to Birdhouse Factory. One of the workers has taken over the business and all is well again. Things heat up with an acrobatic tango dance and choreographed tumbling. As the curtains close and open for a final bow, you get a good look at the performers. These are people from all around the world. Birdhouse Factory’s ten person crew was gathered from Israel, Russia, Canada, Guatemala, Mongolia, the U.S. and Turkmenistan. The performance was nothing less than brilliant. Throughout the entire show you find yourself wondering how that is possible and how they can do that. The older couple to my left was laughing at all the same times as the six year old in front of me. It was a show the entire family could enjoy. While they have reached the end of their tour, I have no doubts that this show will be back very soon. To keep an eye on their performance dates and to find out more about the show visit their website or their Facebook page. And check out the Mondavi Center’s website as well. Every week they host amazing performances by talented and creative performers. Being that we are finding our way out of the Great Recession, there is a lot to be taken from the message of this show. Not that you should go to work and swing from the ceiling, but that there is always hope when times are tough. Sometimes all you have to do is crank up the radio, put on your dancing shoes, and head to the show! Tags: Birdhouse Factory, Cirque Mechanics, Cirque Mechanics’ Birdhouse, Cirque Mechanics’ Birdhouse Factory, Davis Mondavi Center, Great Depression, Mechanics’ Birdhouse Factory, Mondavi, Mondavi Center, UC Davis, UC Davis Mondavi, UC Davis Mondavi Center. Bookmark the permalink. Previous post ← Meet Mark Fox.